Born Edward Henry Harriman in 1848 of an ordained deacon father in the Presbyterian Church and well-connected socialite mother, Young Edward attended private school in New Jersey and New York, but dropped out at age 14 to take a job as a Wall Street errand boy. He moved up rapidly to become a managing clerk and, ultimately, became a stockbroker with a seat on the New York stock exchange. 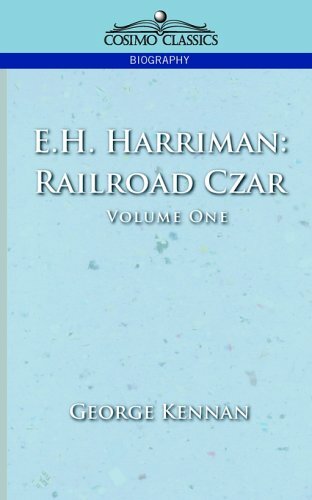 Harriman began investing his own money in railway stocks, and even married into a railroad family. In 1881, he bought his first railroad company outright in upstate New York and his name soon became synonymous with "railroad". Originally presented in two volumes, his life and history is presented here in one combined edition. GEORGE KENNAN (1845-1924) born in Norwalk, Ohio was an American explorer of Russia, and an authority on Siberia. He made the first of his journeys to East Asia in 1864 as an engineer. Nearly the sole authoritative source of information on that region for many years, Kennan's articles on Siberia were published as Tent Life in Siberia (1870) and Siberia and the Exile System (2 vol., 1891). Additionally, he was the great-uncle of the U.S. diplomat and historian George F. Kennan, with whom he shared a birthday.